Even if one believes that good fighter pilots are born and not made, they still must be taught to fly and shoot. Given the record of the Finnish pilots during the Winter and Continuation Wars, one can only assume that not only did Finnish woman give birth to great fighter pilots, but also those pilots were trained quite well. 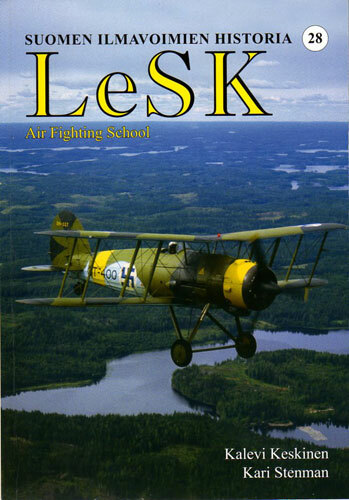 This newest volume in the Finnish Air Force History series provides a good overview of the aircraft and units involved in the training of Finnish pilots, at both the basic and advanced levels. I must say that the narrative is quite brief and primarily focuses on the structure of the Air Fighting School and a description of each unit. There is very little information on the training itself or the aircraft involved. The English is at times quite awkward and a bit of confusion can arise. But there are gems in the narrative, which may make one wonder in amazement. It appears that during the Winter War there was no real need for new airmen and training was minimal, all due to the very low loss rate among frontline airmen. Also, it would have been better if some of the appendices could have been translated. For example, there is a list of fatal flying accidents. While one can easily decipher the aircraft involved, the date, unit and pilot, the circumstance of each accident is only in Finnish. But, as has been the case with other books in the series, the quality of the narrative is not primary to these monographs. Rather, it is the photography that says it all. The pictures are well captioned. The quality and abundance of photographs is as good as, or better than, previous volumes. This may be due to the fact that the photographs were not taken at frontline airfields, but rather at the training facilities. It was also interesting to note that one caption seemed to imply that the Finns made a conscious effort to photograph as many of their aircraft as possible. This would explain the multitude of high quality photographs found in all the books in this series. If nothing else, one takes away from this volume the fact that the Finns, for use in the training role, did not throw any aircraft away or shun the most antiquated aircraft or even captured aircraft. When frontline aircraft were replaced by better equipment, they went to the Air fighting School. When the Ju 88 and Do 17 arrived, older Blenheims became training aircraft. One can also find a bit of black humor in the book; a Gauntlet being assigned the role of a point defense fighter in the event of an air raid on a training facility. Such was the case at the school in Kauhave, where a pair of Gauntlets provided defense. If you already have been collecting this series, I am sure this volume will be your next purchase. For those who are interested in training aircraft, this is a gem of a book. The names are probably not very familiar, Smolik, Viima, Sääski, Stieglitz, Pyry and Tuisku, but they were all fascinating aircraft that were used to help make those born fighter pilots better. All Keri Stenman Publishing books are available direct from the publishers, who now accept credit cards (Visa, MC).